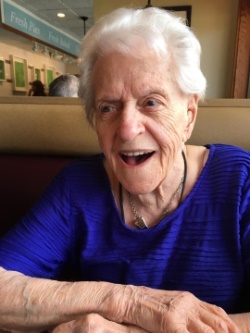 Obituary for Claire V (Caouette) Wheeler | Boucher Funeral Home, Inc.
Claire V. (Caouette) Wheeler, 97, of Naples, Florida, died peacefully January 29, 2019 in Joanne’s House at Hope Hospice of Bonita Springs, FL. Claire was born in Winchendon, MA on April 30, 1921, the tenth child of the late Marcel and Elodit (Fournier) Caouette. Claire is survived by her son, Gordon Wheeler of Naples, FL; daughters, Janice Wheeler of Amherst, MA and Joyce Wheeler of Naples, FL; four grandchildren; five great-grandchildren; several nieces and nephews. She was predeceased by her eleven siblings. A Funeral Mass will be held Thursday, April 4th at 9:30 a.m. in Our Lady of the Holy Rosary Church, 135 Nichols Street, Gardner. Burial will be in St. John's Cemetery, Gardner.